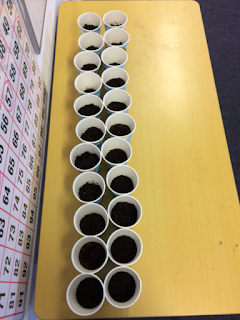 Rang a 4C, by growing seeds indoors, explored the factors that affect plant growth such as water, light and heat . The seeds were planted in January and included spinach, cress and peas. They have recently been planted in the school garden. During this process, the class also investigated how plants transport water from their roots to their leaves using capillary action. A plant has four central pieces. RootsStemLeavesBlossomThe roots drink water from the soil.The water travels through the stem.The leaves light from the sun to receive energy.The blossom helps spread pollen so other flowers can bloom. What you need to complete the experiment. CeleryFood ColoringA CupWaterAdd 1/2 a cup of water to your cup.Add a drop of food coloring to your cup.Place the celery in the cup.Leave over night so the plant can do its magic.Cut half way through the middle of the celery and see if your celery has changed.Check your celery every night to look for a change. Amount of Rainwater that fell in Gaelscoil Uí Drisceoil in November. 5th class measured the amount of rainwater that fell in the school yard using a rain gauge. 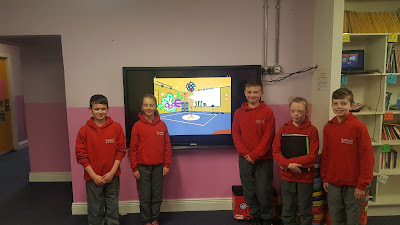 Science Blog The blog team of Stiofán, Megan, Aoife, Kevin and Seán who created this blog. Tá Rang a Cúig agus Rang a Ceathair i mbun Scratch faoi láthair. Presently, we have reached the 7th lesson where we are learning to create our own Mini Game. Agus na iPadanna Scoile á chuir i bhfearas againn.